Beautiful example of this rare vintage bike in very good condition for its age. Most of the chrome shines up like new. Perfectly rideable as is, but with a little more tweaking would run like a dream. 3 speed Sachs internal hub gears. Tyres in good condition. Ladies Raleigh Bike up for grabs. Pale blue color. Rode twice.. In excellent used condition. Bike is 19 inches Basket clips on and off with a push of a button. Helmet available if wanted. RRP is $550 Local pickup only from doreen Victoria. 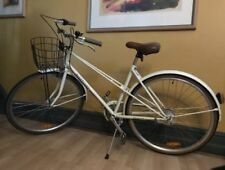 Ladies hybrid bicycle. Condition is Used. Condition reasonable. Retro style bike with detached pedal crank needs repair. Some wear and tear to hand grips and scratches on frame. Condition is Used. Local pickup only. This ladies bike is in near new condition. We bought this for my wife, but she didn't really use it and as such we are willing to let it go. A picture of the tire shows how very little this bike was used. Samson Cycles Cruiser Bike. I do not receive texts. C.O.D. Collection is from Bundoora 3083. Kawana Beach Cruiser Bike Ladies/womens Coral and Pearl 7speed gears- Like new! Trek Commuter Hybrid Women's Bike, Smooth, Comfortable and Reliable. 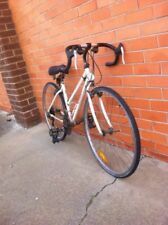 Trek Commuter Hybrid Women's Bike, Smooth, Comfortable and Reliable.. Condition is Used. Local pickup only. Dutch Classic bicycle (dark blue) in good condition and cones with two spare fenders. Has 7 - speed shimano gears and promax side - pull caliper brakes. Only ridden about 2 dozen times and has been in storage since. To be picked up from Rhodes. Inspection welcome. A bit of wear and tear signs (i.e. light rusting) Free helmet. Please contact me on 0430562228 if you are interested. Our award-winning saddles are fitted to every model. With regards to tyres the wheels have been rapped in a set of Kenda Kwicks in a 32c width which have a puncture protection layer to reduce the chances of punctures. Purple in colour, it is quite fetching! 21 speed grip shift gears. 3 on the pedal crank and 7 sprockets on the rear wheel. Everything is in good working order - brakes and gears. Has gas forks in the front. This ladies' bike has hardly been used. It has a little ruston it because it got rained on (not on any vital part of the bike anyway, so can be entirely ignored) but it rides perfectly and comfortably. schwinn bike - Ladies. Condition is barely Used. Great condition Pick up from Preston. In used condition. Marks and scratches from use. Lift and Load. Item is used and hence imperfect. NSW and Interstate. Regret sale. Pick up from Kiama. This bicycle is in new condition. Local pickup only. 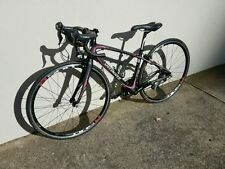 Avanti Ladies bike, medium frame. Avanti ladies bike, medium frame, 3 speed Shimano Nexus gears, simple and easy to use, fr and rear mudguards, chain guard, quick release seat, front basket quick release, 26" x 1.90" tyres, very good sound condition, rides nicely. SPEEDWELL DEFIANCE MOUNTAIN BIKE. 18 SP SHIMANO SIS GEARS. 26” WHEELS. Condition is Used. Local pickup only. BIKE WILL BENEFIT FROM A SERVICE / ONCE OVER DUE TO SITTING. I COULN’T PUMP UP THE TYRES AS I DON’T HAVE THE FITTING. Women's bicycle as new condition. Beautiful ladies Shogun Dutchbike, as new condition, ridden twice. Traditional style, black, with front and rear baskets , lock , lights, and helmet. Bought from Switch bikes in Ipswich. Back injury forces sale. APOLLO Nouveau 7 Ladies vintage style 7 Speed Bike - Womens bicycle . Condition is Used. Local pickup only. Road Mountain Repco Sport Ladies Womens. Condition is Used. Local pickup only. Great condition and with helmet. XDS Rise 1.0 Hybrid Bike 17". - GIANT drink holder included. 21 speed shimano gear. Features front suspension. Front and rear brake. Soft saddle. Wheel size 68cm. All in good condition. Condition is Used. 9 speed Shimano gears. Disc brakes. Bike is in good condition every thing in good working order. This bike is from the infamous Malvern Star range. The Tempest is a 15 gear ladies bike. It has Shimano gears and brakes so you know it’s quality running gear. The bike also has an alloy drink bottle holder and a gel padded seat for extra comfort. Riding this bike can help you build muscle and lose weight while you are having loads of fun. Exercise is proven to promote health for mind and body. This 66cm Tourex Bike features an 18 speed with shimano rear derailleur and front and rear v-brakes. Merida 7.300 Juliet Women Hardtil Mountain Bike 2017 Shimano Size M 17"
As US president JFK once said, “Nothing compares to the simple pleasure of riding a bike”. The wind and fresh air on your face and the pure physical enjoyment of propelling forward under your own pedal power truly is a delight. If you are buying a bike to replace an old favourite, or looking for one to rediscover biking pleasures of earlier days, there are a few things to consider. It is vital to find a bike that is the right “fit” for you. First off, is the right type and style for where you will be riding. Features to consider are the frame and wheel sizes, so how far the reach is to handlebars, gears, pedals and the ground. Do you want straight handlebars to sit upright, and or ones that curve or are lower? Think about whether you want a “step through” bike, or cross bar frame where you raise your leg over the back of the bike to get seated and ready to ride. Hybrid bikes are a marriage between a traditional road bike and a mountain bike. They will take you around town, on your work commute, and on light off-road excursions. Hybrids bikes have a wider tyre width and tread to handle a little light gravel and dirt, and get you along asphalt smoothly. They usually have upright handlebars, which is also a good position for your back, wrists and shoulders. Mountain bikes are the billy-goat-bike of the extended bicycle family. These bikes are for off-road trails, whizzing along forest floors, and uphill and down dale. Constructed of tough materials, they have powerful brakes, and thick tyre treads to give good traction. They are also a favourite with inner city couriers to handle potholes and curbs in the urban jungle. Women's road bikes and racing bicycles are best for speed and distance. They are lightweight and aerodynamically designed so you, and the bike, move like the wind. Road and racing bikes are for you if you are into bicycle racing, riding around town or between towns, or keen on other road events. 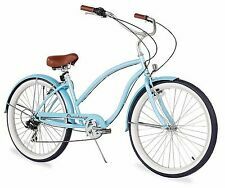 Women's cruiser bicycles are just as the name suggests, cruisy! These sturdy and durable bikes are awesome for a relaxing meandering ride, especially along the beach. Bigger balloon tyres make them easy to ride at your own comfortable pace.